Petitioner :- Pramod Kumar Pandey & Ors. Respondent :- State Of U.P. Secy. Basic Education & Ors. Heard Sri Seemant Singh, learned counsel for the petitioner. Notices on behalf of opposite parties have been accepted by the office of learned Chief Standing Counsel. "i. Issue a writ order or direction, in the nature of mandamus directing the Secretary, U.P. 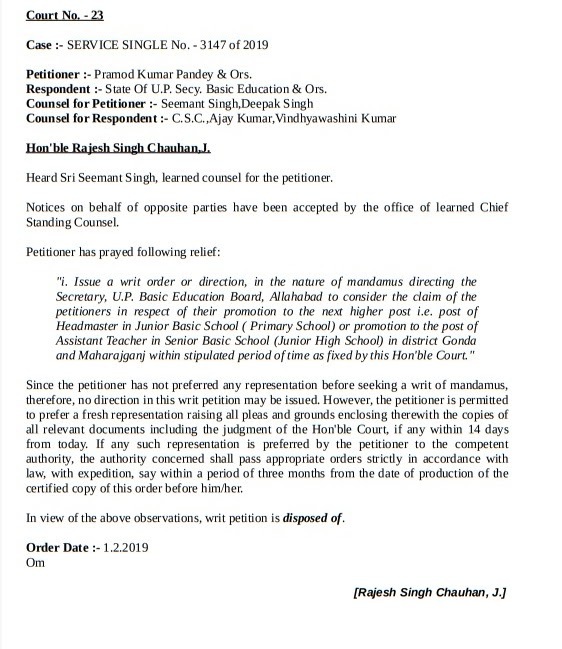 Basic Education Board, Allahabad to consider the claim of the petitioners in respect of their promotion to the next higher post i.e. post of Headmaster in Junior Basic School ( Primary School) or promotion to the post of Assistant Teacher in Senior Basic School (Junior High School) in district Gonda and Maharajganj within stipulated period of time as fixed by this Hon'ble Court." Since the petitioner has not preferred any representation before seeking a writ of mandamus, therefore, no direction in this writ petition may be issued. However, the petitioner is permitted to prefer a fresh representation raising all pleas and grounds enclosing therewith the copies of all relevant documents including the judgment of the Hon'ble Court, if any within 14 days from today. If any such representation is preferred by the petitioner to the competent authority, the authority concerned shall pass appropriate orders strictly in accordance with law, with expedition, say within a period of three months from the date of production of the certified copy of this order before him/her. In view of the above observations, writ petition is disposed of.